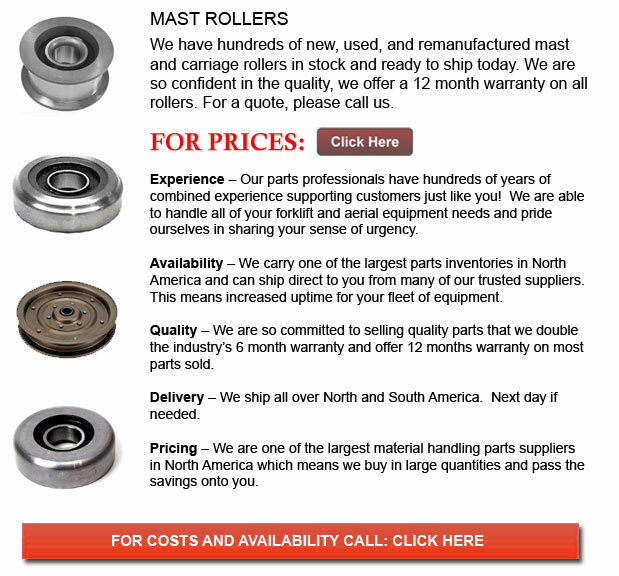 Forklift Mast Rollers - The forklift mast is an essential part of the forklift's frame. These forklifts or lift truck vehicles are industrial machines utilized to raise and transport materials. The mast is a vertical assembly that is responsible for raising and lowering the load. The mast of a lift truck has interlocking rails to give some sideways support. These rails are guided by rollers or brushings. The masts on forklifts use metal plates to be able to transfer merchandise and are powered by hydraulic mechanisms. Hydraulics is defined by the transmission of power which uses pressurized fluid, which in this particular case is oil. Hydraulic cylinders which connect directly to the forklift motor are responsible for driving the mast, causing it to tilt, lower or lift cargo. The pressurized oil drives the cylinder piston to be able to move in a linear motion, or in strokes. The mast is usually worked by means of a lever inside the cab or located in the part of the forklift which houses the forklift control parts and the driver. A swing mast defines a forklift truck using a mast which can rotate in a 90 degree angle in one direction. This design enables the swing mast to work in aisles which are less than 6 feet wide.